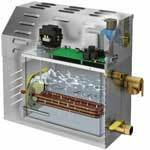 We'll help you get the right steam generator and accessories – We sell steam doors too! We show you how to demo, prep, tile, seal, and install your steam generator and glass doors — Start to finish! With 40 years in the sauna and steam industry, we've developed the expertise, knowledge and trade skills to help you from A-Z with you steamroom equipment, DIY sauna kits, doors and accessories needs and questions. We offer many sizes and styles of steam bathing equipment, including steam showers/suites, prefab steam rooms, residential and commercial size steam generators, steamroom doors and accessories. Some of the manufacturers we represent are: Amerec, Mr. Steam, Steamist, Polar, Steam-Whirl, Thermasol, and Tylo/Helo. We can support you in converting a bath/shower area to a steam room, or even to building your own steam room. Gas Boilers are available please call for quotations. 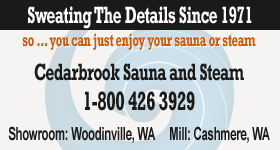 It is important to understand the difference between a steam room and a sauna room. See our presale FAQs area: What is the basic difference between a sauna room and a steam room?